Twenty-nine drugs of disparate structures and physicochemical properties were used in an examination of the capability of human liver microsomal lability data (“in vitroT1/2” approach) to be useful in the prediction of human clearance. Additionally, the potential importance of nonspecific binding to microsomes in the in vitro incubation milieu for the accurate prediction of human clearance was investigated. The compounds examined demonstrated a wide range of microsomal metabolic labilities with scaled intrinsic clearance values ranging from less than 0.5 ml/min/kg to 189 ml/min/kg. Microsomal binding was determined at microsomal protein concentrations used in the lability incubations. For the 29 compounds studied, unbound fractions in microsomes ranged from 0.11 to 1.0. Generally, basic compounds demonstrated the greatest extent of binding and neutral and acidic compounds the least extent of binding. In the projection of human clearance values, basic and neutral compounds were well predicted when all binding considerations (blood and microsome) were disregarded, however, including both binding considerations also yielded reasonable predictions. Including only blood binding yielded very poor projections of human clearance for these two types of compounds. However, for acidic compounds, disregarding all binding considerations yielded poor predictions of human clearance. It was generally most difficult to accurately predict clearance for this class of compounds; however the accuracy was best when all binding considerations were included. Overall, inclusion of both blood and microsome binding values gave the best agreement between in vivo clearance values and clearance values projected from in vitro intrinsic clearance data. The use of in vitro drug metabolism data in the understanding of in vivo pharmacokinetic data has recently become an area of scientific interest (Houston, 1994;Houston and Carlile, 1997; Iwatsubo et al., 1997). This has partially stemmed from a trend in the pharmaceutical industry to use in vitro drug metabolism data, using human-derived reagents, as a criterion to select compounds for further development (Rodrigues, 1997). Thus, in vitro metabolism data is used in a prospective manner to choose those compounds for further development that are expected to possess commercially acceptable pharmacokinetic properties (e.g., half-life permitting once-per-day administration regimens, low oral clearance to reduce dose, etc.). Several investigators have recently described methods whereby preclinical drug metabolism and pharmacokinetic data can be used to predict human pharmacokinetic parameters (Obach et al., 1997; Lave et al., 1997a,b; Mahmood, 1998a,b). The first demonstration of the correlation between in vivo clearance values and clearance values calculated from liver microsomal metabolism intrinsic clearance data was made by Rane et al. (1977) for the rat. Intrinsic clearance data were obtained by determination of the enzyme kinetic parameters (Vmax andKM). In our work, we described two related methods whereby human clearance could be predicted from in vitro metabolism data (Obach et al., 1997). In one method, the enzyme kinetic parameters Vmax andKM were determined and converted to intrinsic clearance (CL′int)1, which is similar to that described by Rane et al. (1977). In the other method, referred to as the “in vitro T1/2method”, CL′int was determined by measuring the first-order rate constant for consumption of the substrate at a low concentration. Interestingly, for both of these methods, a better correlation was observed between the actual and predicted clearance values if the free fraction in blood was disregarded in the well-stirred or parallel-tube equations describing hepatic extraction. One possible reason for the observation that a better prediction of human clearance was made when disregarding plasma protein binding was that the substrates were bound in the microsomal incubations, and that the extent of this binding could be great enough so as to almost cancel out the plasma protein binding term in the well-stirred and parallel-tube equations (Obach, 1996). This possibility was further substantiated in an examination of probe substrates propranolol, imipramine, and warfarin (Obach, 1997). In this report, it was demonstrated that the lipophilic amines propranolol and imipramine were bound to microsomes, and that incorporation of this binding term aided in the accurate prediction of human clearance from in vitro intrinsic clearance data. The acidic drug, warfarin, exhibited this phenomenon to a much lesser extent. However, for all three drugs overall, incorporation of both plasma protein and microsome binding terms generally yielded more accurate predictions of human clearance. The objective of the experiments described herein is to more exhaustively test the hypothesis that microsomal binding is an important phenomenon in the prediction of in vivo pharmacokinetics from in vitro drug metabolism data. To this end, human hepatic microsomal metabolism data were gathered for 29 drugs, using the in vitroT1/2 approach. Additionally, the extent of nonspecific binding to microsomes in the in vitro matrix was measured for each drug. The drugs used in these experiments span a broad range of structural types (Fig. 1) and include basic compounds (positively charged at pH 7.5), acidic compounds (negatively charged at pH 7.5), and neutral compounds (no charge at pH 7.5). The data set was used to project human clearance from the in vitro intrinsic clearance data to determine whether the most accurate projections are made by disregarding all binding data, including only blood binding values, or including both blood and microsomal binding values. 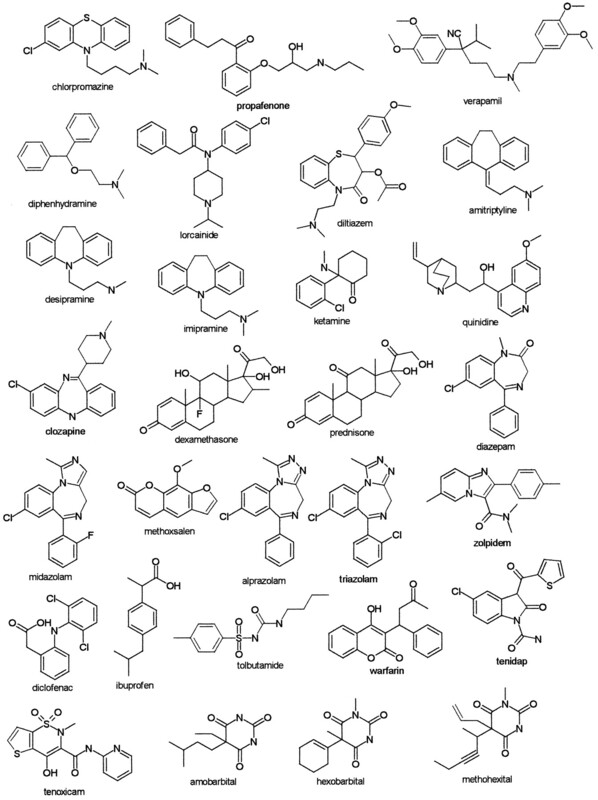 Chemical structures of the 29 drugs examined in this study. The 29 drugs examined in these experiments were obtained from Sigma Chemical Co. (St. Louis, MO) with the exception of lorcainide (obtained from ICN, Aurora, OH), methoxsalen (obtained from Aldrich Chemical, Milwaukee, WI), zolpidem (obtained from Research Biochemicals International, Natick, MA), and methohexital (obtained from Radian Inc., Dallas, TX). NADPH was obtained from Sigma. Solvents and other reagents were from common sources and were of HPLC grade or better. Human liver microsomes were from an in-house bank of liver microsomes maintained at Pfizer Central Research (Groton, CT). A pool was prepared from six liver microsomal preparations from six individual donors that were selected on the basis of having average activities for five of the major drug metabolizing cytochrome P-450 (CYP) enzymes (CYP1A2, CYP2C9, CYP2C19, CYP2D6, and CYP3A) normalized per microsomal protein content. Microsomes from putative CYP2D6 and CYP2C19 poor metabolizers were excluded. The P-450 content of this pool, as determined by spectral means (Omura and Sato, 1964) was 0.26 nmol/mg microsomal protein. CYP isoform specific marker substrate activities were as follows: CYP1A2, phenacetin O-deethylase of 0.147 nmol/min/mg protein (at 50 μM phenacetin); CYP2C9, tolbutamide 4-hydroxylase of 0.23 nmol/min/mg protein (at 1.0 mM tolbutamide); CYP2C19, S-mephenytoin 4′-hydroxylase of 0.093 nmol/min/mg protein (at 1.0 mM S-mephenytoin); CYP2D6, bufuralol 1′-hydroxylase of 0.075 nmol/min/mg protein (at 10 μM bufuralol); and CYP3A4, testosterone 6β-hydroxylase of 2.7 nmol/min/mg protein (at 250 μM testosterone). All glassware was subjected to gas phase silylation before use. Human liver microsomal incubations were conducted in triplicate. General conditions are described as follows with details specific to each drug listed in Table 1. Incubation mixtures consisted of liver microsomes (0.3–10 mg microsomal protein/ml), substrates (1.0 μM), MgCl2 (3.3 mM), and NADPH (1.3 mM) in a total volume of 0.5 ml potassium phosphate buffer (25 mM, pH 7.5). Reactions were commenced with the addition of NADPH and shaken in a water bath open to the air at 37°C. AtT = 0 and at five time points ranging to 40 min, aliquots (50 μl) were removed and added to termination mixtures containing internal standards as listed in Table 1. The samples were processed by extraction into methy t-butyl ether (3 ml), the aqueous layer was frozen in a dry ice-acetone bath, the organic solvent was decanted and evaporated under N2 at 30°C. The residue was reconstituted in 50 μl HPLC mobile phase A (see below). For methoxsalen samples, the work-up procedure consisted of precipitation of protein with CH3CN (100 μl), removal of precipitated materials by centrifugation, and analysis of the supernatant by HPLC-mass spectrometry (MS). Drugs (1.0 μM) were mixed with human liver microsomes (at protein concentrations used for the respective metabolic incubations), MgCl2 (3.3 mM) and potassium phosphate buffer (25 mM; pH 7.5). The mixtures were subjected to equilibrium dialysis versus buffer/MgCl2 at 37°C using a Spectrum apparatus (Spectrum Industries, Los Angeles, CA) as per instructions of the manufacturer. Spectra-Por no. 4 membranes, with molecular mass cutoff of 12 to 14 kDa, were used and the cells were rotated at 20 rpm for 5 h. (These dialysis conditions had been previously shown to give equilibrium for this dialysis apparatus; Obach, 1997). Dialysis experiments were done in triplicate. On completion of the dialysis period, the microsome and buffer samples were removed, processed as described above, and analyzed by HPLC-MS. Microsome samples (50 μl) were mixed with control buffer (100 μl), and buffer samples (100 μl) were mixed with control microsomes (50 μl) to yield an identical matrix before sample work-up. Drug recovery through the dialysis procedure was determined by analyzing samples of the mixtures that were not subjected to dialysis, and recovery values were 86% or greater. The HPLC-MS system consisted of a Hewlett- Packard 1100 quaternary gradient HPLC pump with membrane degasser (Hewlett-Packard, Palo Alto, CA), a CTC PAL autoinjector (Leap Technologies, Carrboro, NC), and a PE-Sciex API 100 single quadrupole mass spectrometer (Sciex, Thornhill, Ontario, Canada) with a turbo ionspray interface. There were various mobile phases used for the different drugs as listed in Table 1. Mobile phase system 1 consisted of 20 mM acetic acid (adjusted to pH 4 with NH4OH) and CH3CN used at various percentages of organic solvent (as listed in Table 1). System 2 consisted of 5 mM NH4OAc (pH unadjusted) and CH3CN at various percentages as listed in Table1. The column used was a Phenomenex Luna C18 narrow bore column (2.5 × 50 mm) with a 3-μm particle size (Phenomenex, Torrance, CA). The flow rate was 0.5 ml/min and the mobile phase composition was held isocratically for each analyte. The injection volume was 25 μl. The effluent was split with approximately 0.25 ml/min introduced into the turbo ionspray source of the mass spectrometer. Source parameters (e.g., orifice voltage, temperature, gas flow rates, etc.) were individually optimized for each drug, and the molecular ion (either M + H+ or M − H−, depending on the orifice polarity) was followed for each compound and internal standard in the selected ion monitoring mode. In the determination of the in vitro t1/2, the analyte/ISTD peak height ratios were converted to percentage drug remaining, using the T = 0 peak height ratio values as 100%. The slope of the linear regression from log percentage remaining versus incubation time relationships (−k) was used in the conversion to in vitro T1/2, values by in vitro T1/2 = −0.693/k. Conversion to in vitro CLint′ (in units of ml/min/kg) was done using the following formula (Obach et al., 1997):CLint′=0.693in vitro T1/2·ml incubationmg microsomes·45 mg microsomesgm liver·20 gm liverkg b.w. For microsomal binding, the fraction unbound in the incubation mixture was calculated by:fu(mic)=drug/ISTD peak height ratio in buffer sample2·drug/ISTD peak height ratio in microsome sample with the factor of 2 in the denominator because the aliquot volume of buffer samples analyzed was twice that analyzed for the microsome samples (see above). The use of HPLC-atmospheric pressure ionization-MS was an important tool in the gathering of these metabolic lability and microsomal binding data. The selectivity and sensitivity of this instrumentation permitted facile quantitation of a wide variety of drug structures. Chromatographic methods were developed for each compound using the same column and only two types of mobile phases, with virtually the only customization required for each compound being determination of an optimal percentage of organic modifier (CH3CN) to effect elution of drug and internal standard within a reasonable run time. In vitro T1/2 data in pooled human liver microsomes for the 29 compounds examined are listed in Table3. Metabolic lability of this set of compounds spanned a wide range, the most stable compound being warfarin (in vitro T1/2 was immeasurably long at a microsomal protein concentration of 10 mg/ml), and the most labile being diclofenac, propafenone, and midazolam (scaled CL′int values of 160 ml/min/kg or greater). Within each general class of compounds (weak bases, weak acids, and neutral compounds), intrinsic clearance values spanned a broad range. Bases ranged from low intrinsic clearance values of 3.4 and 4.6 ml/min/kg for quinidine and clozapine, respectively, to high intrinsic clearance values of 122 and 166 ml/min/kg for verapamil and propafenone, respectively. Intrinsic clearance values for acids ranged from less than 0.52 ml/min/kg for warfarin and 0.90 and 0.94 ml/min/kg for tolbutamide and amobarbital, respectively, up to 189 ml/min/kg for diclofenac. Intrinsic clearance values for the neutral compounds ranged from 1.6 ml/min/kg for alprazolam to 160 ml/min/kg for midazolam. The extent of microsomal binding was determined for each compound using a microsomal protein concentration equal to that used in the metabolic incubations (Table 3). Because different protein concentrations were used, the compounds cannot be rank ordered with regard to extent of binding to microsomes. The values ranged from no binding to approximately 90% bound. Furthermore, those compounds that exhibited the greatest extent of binding were not necessarily those in which the microsomal protein concentration was highest. In general, the weak bases demonstrated greater binding to microsomes, despite the fact that microsomal concentrations used for the bases were, on average, lower than those used for the neutral and acidic compounds. 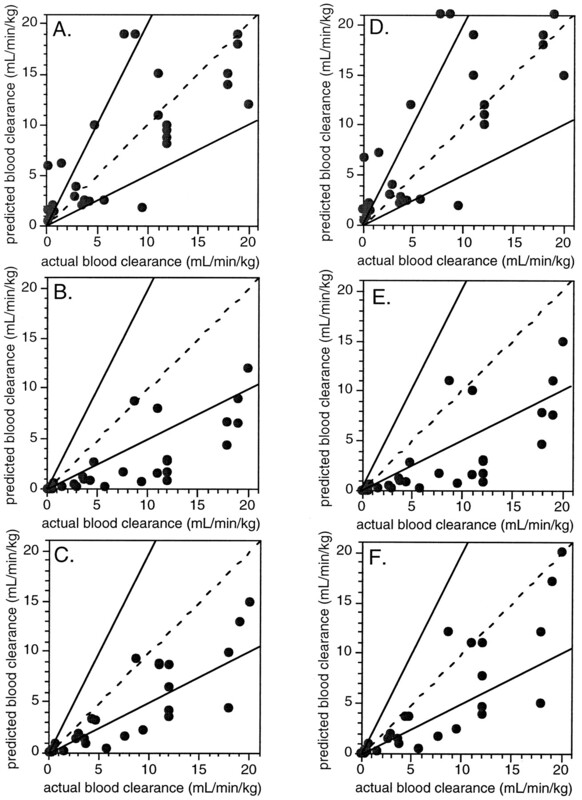 A summary of human blood clearance predictions from the in vitro data is presented in Table 4 and predicted clearance values are plotted versus actual clearance values in Fig.2. Equations for both the well-stirred and the parallel-tube models of hepatic extraction were applied under three variations: disregarding all binding values (Table 4, eqs. 1 and4), including only blood binding (Table 4, eqs. 2 and 5), and including both blood and in vitro microsome binding (Table 4, eqs. 3 and 6). Overall accuracy values, determined as described in Experimental Procedures, are listed in Table 5. For all compounds examined (n = 29), average fold error values were just over 2-fold in the cases in which either no binding values were considered or all binding values were considered. The most accurate method was the use of the parallel-tube model with both blood and microsome binding incorporated (average fold error of 2.13). Using only the blood binding value in either model of hepatic extraction yielded very poor predictions of human clearance. When subsets of compounds were considered, some differences as to which were the most accurate methods were observed. For weak bases and neutral compounds, disregarding all binding in either model of hepatic extraction yielded the best agreement between actual human clearance values and those projected from in vitro intrinsic clearance data. However, for the acidic compounds, the most accurate clearance prediction methods incorporated both blood and microsome binding. Figure3 contains plots of accuracy of predicted clearance values using the six equations versus the respective human clearance values. 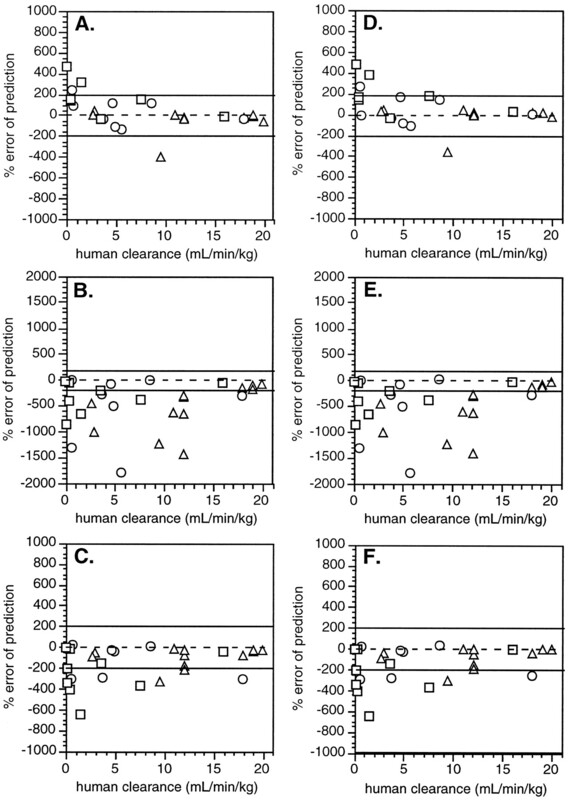 Plots of human clearance values predicted from in vitro intrinsic clearance data versus actual human clearance values. A, well-stirred model disregarding all binding parameters. B, well-stirred model incorporating only plasma protein binding. C, well-stirred model incorporating both plasma protein and microsome binding. D, parallel-tube model disregarding all binding parameters. E, parallel-tube model incorporating only plasma protein binding. F, parallel-tube model incorporating both plasma protein and microsome binding. Accuracy of human clearance values predicted from in vitro intrinsic clearance data versus actual human clearance values. A, well-stirred model disregarding all binding parameters. B, well-stirred model incorporating only plasma protein binding. C, well-stirred model incorporating both plasma protein and microsome binding. D, parallel-tube model disregarding all binding parameters. E, parallel-tube model incorporating only plasma protein binding. F, parallel-tube model incorporating both plasma protein and microsome binding. Symbols are as follows: basic compounds (▵); neutral compounds (○); acidic compounds (■). Lines signify 2-fold errors between predicted and actual clearance values. Note the different scales for B and E. Errors for tenidap and tenoxicam in A and D are well off scale (5000–6000% error) and are not depicted. The prediction of human pharmacokinetic parameters for new chemical entities has become an important approach in the drug discovery process. For any given drug discovery approach, hundreds of compounds will satisfy potency objectives, however few can be examined in humans. New chemical entities require extensive investigation and investment of resources prior to administration to humans, and therefore it is desirable to be able to exclude compounds from this process that would be expected to exhibit unsatisfactory human pharmacokinetic properties. Recently, several investigators have described various methods and approaches whereby human pharmacokinetic parameters can be predicted from in vitro and/or preclinical pharmacokinetic data (Hoener, 1994; Gobburu and Shelver, 1995; Lave et al., 1997a,b; Obach et al., 1997; Kuhnz and Gieschen, 1998; Sarver et al., 1997; Mahmood, 1998a,b). These methods vary in complexity and the amount of data required for accurate predictions. One of the simplest methods described to predict human clearance is the use of human hepatic microsomal lability data, termed the in vitroT1/2 approach (Obach et al., 1997). In this method, one incubates the test compound with human liver microsomes in the presence of appropriate cofactors (NADPH for CYP catalyzed reactions) and measures the first-order rate of consumption of the test compound. This rate is converted to an in vitro CL′int value, scaled-up to reflect CL′int in vivo, and inserted into a model of hepatic extraction. A high degree of success was previously reported for this particular approach, however the number of test compounds was low, and a majority of the compounds were of a similar physicochemical class (lipophilic amines). One of the objectives of the present experimentation was to further test the in vitroT1/2 approach with more compounds and greater structural diversity. The use of hepatic microsomes in the prediction of clearance requires acceptance of several assumptions and caveats: 1) metabolic clearance is the major mechanism of clearance (i.e., CLmetabolism ≫ CLrenal + CLbiliary + CLother); 2) the liver is the major organ of clearance (i.e., CLhepatic ≫ ΣCLall other organs); 3) oxidative metabolism predominates over other metabolic routes such as direct conjugative metabolism, reduction, hydrolysis, etc. ; 4) rates of metabolism and enzyme activities in vitro are truly reflective of those that exist in vivo. Additionally, a tenet of the well-stirred and parallel-tube models of hepatic extraction is that the unbound concentration of drug in the plasma is equal to the unbound concentration in the hepatocyte. Therefore, facilitated transport processes that could possibly be responsible for drug uptake or drug extrusion from hepatocytes are not accounted for in these models. The in vitro T1/2 approach has two additional inherent assumptions that are not required if intrinsic clearance were determined using the more rigorous approach of calculating intrinsic clearance from enzyme kinetic data (i.e.,Vmax/KM). These are: 1) the substrate concentration employed (1.0 μM in the case of this report) is well below the apparent KMfor substrate turnover, and 2) there is no significant product inhibition, nor is there any mechanism based inactivation of enzyme. Overall, clearance for these 29 compounds was generally underestimated using any of the six approaches, giving credence to the notion that the aforementioned assumptions are not completely valid in many cases. It should be noted that the 29 compounds chosen for this examination represent a set for which other clearance mechanisms (e.g., renal clearance, nonoxidative clearance, etc.) are known to be less important than hepatic oxidative metabolic clearance, but some are known to fall outside the scope of the aforementioned assumptions, e.g., nonhepatic metabolism of dexamethasone (Diederich et al., 1996; Tomlinson et al., 1997), nonoxidative components of metabolic clearance such as the reductive metabolism of warfarin (Moreland and Hewick, 1975) or glucuronidation of ibuprofen (Rudy et al., 1991), and product inhibition of diltiazem (Sutton et al., 1997). A second objective of this work was to further explore the potential importance of nonspecific reversible binding of substrate in microsomal incubations in the prediction of human clearance from in vitro intrinsic clearance data. Earlier work suggested that this phenomenon was important in the projection of clearance of imipramine and propranolol from hepatic microsomal CL′int(Obach, 1997). The present experimentation sought to examine this possibility for a larger number of compounds of wider physicochemical properties. Two models of hepatic clearance were examined (well-stirred and parallel-tube models) under three different variations each: 1) assuming that no binding parameter has impact on clearance (Table 4, eqs. 1 and 4); 2) incorporating binding to blood constituents only (Table 4, eqs. 2 and 5); and 3) incorporating both blood and microsome binding (Table 4, eqs. 3 and 6). When considering all 29 compounds, either disregarding all binding or including both blood and microsome binding yielded the most accurate projections of human clearance (Table5). However, when the three different classes of compounds were examined separately, it appeared that disregarding all binding yields the most accurate projections of human clearance for basic and neutral compounds but not for the acidic compounds. For the acidic compounds, human clearance projections were most accurate when including all binding parameters. For the basic compounds, disregarding any potential impact of blood and microsome binding yielded accurate projections of human clearance. However, when the free-fraction in blood was accounted for, clearance of many of the basic compounds, especially those highly bound to blood proteins, were markedly underpredicted (e.g., chlorpromazine, amitriptyline, desipramine, imipramine, diltiazem, quinidine, and clozapine). Many of these compounds were substantially bound to microsomes; thus incorporation of both blood and in vitro unbound fractions again yielded more accurate projections of human clearance. However, clearance for some of the basic compounds were still underprojected (e.g., amitriptyline and diltizem). Diphenhydramine was substantially underprojected in all cases; the reason for this is not known. Also, an interesting case was that of ketamine, in which the extent of binding to microsomes was greater than that to blood proteins. For neutral compounds, disregarding all binding in the projection of clearance from in vitro intrinsic clearance yielded some overprojections (e.g., diazepam, midazolam, and triazolam), however disregarding all binding yielded the greatest degree of accuracy. As with the basic compounds, inclusion of blood protein binding led to underprojections of clearance (e.g., steroids, diazepam, methoxsalen, and zolpidem), whereas including both blood and microsome binding yielded some improvements in clearance projections (e.g., triazolam, diazepam, and prednisone). Disregarding all binding yielded marked overprojections of human clearance for many of the acidic drugs (e.g., diclofenac, ibuprofen, tenidap, tenoxicam, and warfarin), whereas including only the unbound fraction in blood yielded underprojections (e.g., diclofenac, warfarin, tenidap, and ibuprofen). Binding to microsomes was not substantial in the cases of many of the acidic drugs, so that improvements in the projection of clearance that were observed when including both blood and microsome binding for basic and neutral compounds, were not observed for all of the acidic drugs (e.g., diclofenac, tolbutamide, and ibuprofen). However, some of the acidic drugs demonstrated significant microsome binding and clearance projections were improved with the inclusion of this parameter (e.g., tenoxicam, tenidap, and amobarbital). It should be recognized that the phenomenon of nonspecific binding to microsomes in in vitro metabolic incubations is not necessary reflective of the in vivo situation. The inclusion of the unbound fraction of drug in the in vitro incubation matrix is necessary so that the in vitro and in vivo situations can be directly reconciled via a common parameter: unbound intrinsic clearance. Drug that is sequestered in microsomes in vitro is presumed to be unavailable for direct interaction with metabolizing enzymes, just as drug that is bound to plasma proteins and tissue macromolecules in vivo is presumed to be unable to be directly acted on by drug metabolizing enzymes. In both cases, drug molecules must first dissociate from the nonspecific binding sites before they can bind to, and be metabolized by, drug metabolizing enzymes. In summary, these data support two conclusions. First, the liver microsomal in vitro T1/2 approach can be a suitable approach to measure in vitro CL′int, which can be scaled up to the in vivo situation and used in the prediction of human clearance. This is provided that several caveats, outlined above, are taken into consideration. Second, the measurement of nonspecific binding to microsomes under conditions used in the measurement of in vitro T1/2, and inclusion of these unbound fraction values in the prediction of clearance from in vitro intrinsic clearance data appears to be a more broadly applicable approach than either disregarding all binding or including only blood binding parameters. However, it may be the case for some classes of compounds (especially basic compounds), that disregarding all binding values yields more accurate predictions of human clearance. (1985) Imipramine and desipramine disposition in the elderly. J Pharmacol Exp Ther 232:183–188. (1987) Estimating the clearance of amylobarbitone from a single plasma measurement. Br J Clin Pharmacol 23:94–98. (1981) Clinical pharmacokinetics of sulfonylurea hypoglycemic drugs. Clin Pharmacokinet 6:215–241. (1995) The pharmacokinetics of 8-methoxypsoralen following iv administration in humans. Br J Clin Pharmacol 40:347–360. (1986) Pharmacokinetics of diphenhydramine and a demethylated metabolite following intravenous and oral administration. J Clin Pharmacol 26:529–533. (1976) Pharmacokinetics of methohexitone following intravenous infusion in humans. Br J Anaesth 48:643–649. (1975) Pharmacokinetics of hexobarbital in man after intravenous infusion. J Pharmacokinet Biopharm 3:1–11. (1988) First-pass metabolism of imipramine and desipramine: Impact of the sparteine oxidation phenotype. Clin Pharmacol Ther 43:400–406. (1993) Propafenone, a reappraisal of its pharmacology, pharmacokinetics and therapeutic use in cardiac arrhythmias. Drugs 45:85–130. (1987) In vitro binding of diclofenac sodium in plasma and synovial fluid. J Pharm Sci 76:105–108. (1988) Clinical pharmacokinetics of clozapine in chronic schizophrenic patients. Eur J Clin Pharmacol 34:441–449. (1974) Pharmacokinetics of chlorpromazine after single and chronic dosage. Clin Pharmacol Ther 21:437–448. (1996) The metabolism of 9a-fluorinated steroids in the human kidney. Endocr Res 22:803–810. (1992) Comparative pharmacokinetic profile of two imidazopyridine drugs: Zolpidem and alpidem. Drug Metab Rev 24:239–266. (1986) Clinical pharmacokinetics of verapamil, nifedipine, and diltiazem. Clin Pharmacokinet 11:425–449. (1984) Pharmacokinetics of (+)-, (−)-, and (±)-verapamil after intravenous administration. Br J Clin Pharmacol 17:453–458. (1995) Single and multiple dose pharmacokinetics of tenidap sodium in healthy subjects. Br J Clin Pharmacol 39:11S–15S. (1976) Nonlinear pharmacokinetic model of intravenous anesthesia. J Pharm Sci 65:1001–1006. (1995) Quantitative structure-pharmacokinetic relationships (QSPR) of beta blockers derived using neural networks. J Pharm Sci 84:862–865. (1980) Diazepam dispositional determinants. Clin Pharmacol Ther 27:301–312. (1977) Pharmacokinetics of quinidine in humans after intravenous, intramuscular, and oral administration. J Pharmacol Exp Ther 202:365–378. (1984) Pharmacokinetics of tenoxicam in healthy human volunteers. Eur J Rheum Inflam 7:33–44. (1983) Pharmacokinetics and bioavailability of midazolam. Br J Clin Pharmacol 16:S1–S199. (1994) Predicting the hepatic clearance of xenobiotics in humans from in vitro data. Biopharm Drug Dispos 15:295–304. (1978) Pharmacokinetics of lorcainide in man: A new antiarrythmic agent. Clin Pharmacokinet 3:407–418. (1998) Predicting the oral bioavailability of 19-nortestosterone progestins in vivo from their metabolic stability in human liver microsomal preparations in vitro. Drug Metab Dispos 26:1120–1127. (1997a) Integration of in vitro data into allometric scaling to predict hepatic metabolic clearance in man: Application to 10 extensively metabolized drugs. J Pharm Sci 86:584–590. (1997b) The use of human hepatocytes to select compounds based on their expected hepatic extraction ratios in humans. Pharm Res 14:152–155. (1980) The distribution of chlorpromazine between plasma and erythrocytes. Acta Pharmacol Toxicol 47:300–304. (1998a) Interspecies scaling: Predicting volumes, mean residence time and elimination half-life. Some suggestions. J Pharm Pharmacol 50:493–499. (1998b) Integration of in vitro data and brain weight in allometric scaling to predict clearance in humans: Some suggestions. J Pharm Sci 87:527–529. (1990) Pharmacokinetics and absolute bioavailability of ibuprofen after oral administration of ibuprofen lysine in man. Biopharm Drug Dispos 11:265–278. (1972) Plasma disappearance and cerebral effects of chlorpromazine in cirrhosis. Clin Sci 43:143–151. (1975) Studies on a ketone reductase in human and rat liver and kidney soluble fraction using warfarin as a substrate. Biochem Pharmacol 24:1953–1957. (1996) The importance of non-specific binding in in vitro matrices, its impact on enzyme kinetic studies of drug metabolism reactions, and implications for in vitro-in vivo correlations. Drug Metab Dispos 24:1047–1049. (1997) Nonspecific binding to microsomes: Impact on scale-up of in vitro intrinsic clearance to hepatic clearance as assessed through examination of warfarin, imipramine, and propranolol. Drug Metab Dispos 25:1359–1369. (1964) The carbon monoxide binding pigment of liver microsomes. J Biol Chem 239:3137–3142. (1972) Sodium warfarin. Pharmacology 8:181–190. (1983) Pharmacokinetics of betamethasone in healthy adults after intravenous administration. Eur J Clin Pharmacol 25:643–650. (1987) Binding of 8-methoxypsoralen to human serum proteins and red blood cells. Br J Dermatol 117:207–215. (1984) Pharmacokinetics of quinidine and three of its metabolites in man. J Pharmacokinet Biopharm 12:1–21. (1977) Prediction of hepatic extraction ratio from in vitro measurement of intrinsic clearance. J Pharmacol Exp Ther 200:420–424. (1997) Preclinical drug metabolism in the age of high-throughput screening: An industrial perspective. Pharm Res 14:1504–1510. (1991) Stereoselective metabolism of ibuprofen in humans: Administration of R-, S- and racemic ibuprofen. J Pharmacol Exp Ther 259:1133–1139. (1990) Clinical pharmacokinetics of imipramine and desipramine. Clin Pharmacokinet 18:346–364. (1997) Estimating xenobiotic half-lives in humans from rat data: Influence of log P. Environ Health Persp 105:1204–1208. (1985) Prediction of the disposition of nine weakly acidic and six weakly basic drugs in humans from pharmacokinetic parameters in rats. J Pharmacokinet Biopharm 13:477–491. (1977) Prednisone for chronic active liver disease: Pharmacokinetics, including conversion to prednisolone. Gastroenterology 72:910–913. (1983) Amitriptyline disposition in young and elderly normal men. Clin Pharmacol Ther 33:360–366. (1979) Pharmacogenetics of tolbutamide metabolism in humans. Diabetes 28:41–51. (1983) Pharmacokinetics and pharmacodynamic effects of diltiazem. Am J Cardiol 51:1364–1374. (1984) Pharmacokinetics and pharmacodynamics of alprazolam after oral and IV administration. Psychopharmology 84:452–456. (1987) Pharmacodynamics of triazolam after intravenous administration. J Clin Pharmacol 27:971–979. (1987) Pharmacokinetic implications of lorcainide therapy in patients with normal and depressed cardiac function. J Clin Pharmacol 27:122–132. (1997) Role of CYP3A4 in human hepatic diltiazem N-demethylation: Inhibition of CYP3A4 activity by oxidized diltiazem metabolites. J Pharmacol Exp Ther 282:294–300. (1997) The in vitro metabolism of dexamethasone (DEX) in human liver and kidney: The involvement of CYP3A4 and CYP17 (17,20 LYASE) and molecular modeling studies. Biochem Pharmacol 54:605–611. (1979) Disposition of synthetic glucocorticoids. I. Pharmacokinetics of dexamethasone in healthy adults. J Pharmacokinet Biopharm 7:249–264. (1985) Comparative pharmacology of the ketamine isomers. Br J Anaesth 57:197–203. (1979) The pharmacokinetics of diclofenac following intravenous and oral administration. Eur J Clin Pharmacol 16:405–410.